Q: What is blasphemy of the Holy Spirit? 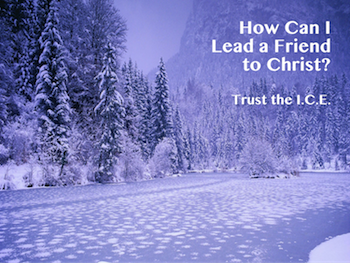 Application: James, the brother of Jesus, tells us that all good things come from God (James 1:17). Paul warns us not to "quench the Spirit" (1 Thessalonians 5:19, NIV). We must be very careful not to limit the Holy Spirit with man-made doctrines that assign His work to coincidence or even human effort. Examples: Luck, "Mother Nature" or even the conclusion that miracles have ceased. 2. Someone in the audience had actually spoken a slanderous statement against the Holy Spirit and Jesus was condemning those words. It is interesting to note that Jesus' family said something similar in verse 21, “He is out of his mind", yet there is no indication that Mary or Jesus' siblings were eternally condemned. Application: Blasphemy of the Holy Spirit is more than just concluding or even stating that a person is acting crazy. While it is nothing less than stupidity that causes a person to rob God of His glory, blasphemy intentionally goes one step beyond that. Blasphemy of the Holy Spirit robs God then openly assigns credit for His work to an evil entity. 3. In 1 Timothy 4:2, Paul speaks of a condition that is so evil it causes people to act as if their "consciences have been seared as with a hot iron." (NIV) When you read the surrounding context of 1 Timothy 4:1-5, it sounds a lot like the Jewish leaders who had made the blasphemous statement in Mark 3:22. Application: Blasphemy of the Holy Spirit is as much about the condition of a person's heart and the stubborn pattern of a person's life as it is about the statement they make. Years ago, I had a preacher friend who committed suicide. He believed that during the rebellious years of his youthful life he had blasphemed the Holy Spirit. Because of the mistake he assumed he had made, my friend concluded there was no hope of his redemption. Please understand, this teaching is a very difficult doctrine of the Lord and I would caution you not to draw extreme conclusions like my friend. It is my personal belief that blasphemy of the Holy Spirit is not an accidental occurrence or even a one-time mistake. Blasphemy of the Holy Spirit involves stubborn intent, assignment of God's glory to an evil entity and a pattern of life that results in a seared conscience. 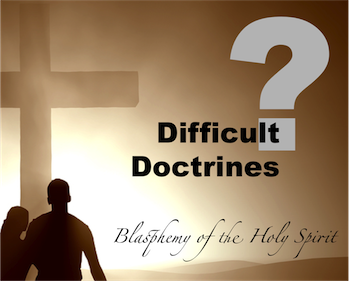 Difficult Doctrines: "Predestination, Romans 8 & Ephesians 1"
Back to Top of "Difficult Doctrines: Blasphemy of the Holy Spirit, Mark 3:20-30"